By Nicole Martinelli Tourists have long crowded in museums to admire Caravaggio’s Bacchus, but a new 3.4 billion-pixel image of the painting allows for an amazingly detailed look at an old master’s work from your computer screen. It’s the first in a series of super-high-resolution digital versions of masterpieces from Italy’s Uffizi Gallery, including Sandro Botticelli’s The Birth of Venus and the Annunciation by Leonardo da Vinci. This image of Bacchus makes Michelangelo Merisi da Caravaggio’s revolutionary realism — as seen in the gritty fingernails of his reclining model in the sensual painting nicknamed “drunk Bacchus” — easy to zoom in on and linger over. Minute details usually mulled over by art historians, such as the rumored self-portrait of the artist reflected in the wine decanter, are just a few clicks away. The Tuesday launch is a kind of love letter to the Baroque bad boy, believed born on this day in 1571. It’s the latest project from HAL9000, a company specializing in art photography that captured a high-res version of Leonardo Da Vinci’s The Last Supper three years ago. Advances in photographic technology have nearly doubled the capacity of HAL9000’s imaging devices, soaring from 16 billion pixels in 2007’s Last Supper conversion — then claimed to be the maximum available — to 28 billion pixels in Botticelli’s Primavera, aka Allegory of Spring, another piece digitized by the company. That’s about 3,000 times the resolution of a normal digital camera. Pixel density, measured in pixels per inch, has also increased from 580 ppi to about 1,500 ppi, resulting in much greater detail. Using proprietary technology dubbed FlyBy, in a standard HAL9000 calls Real High Definition that the company developed to scan the Shroud of Turin, it took about three hours to shoot 198 pictures of Caravaggio’s oil work with a Nikon D3X hitched up to a stabilizing structure something like a pantograph. Once stitched together, the resulting state-of-the art digital Bacchus weighs in at 17 GB. 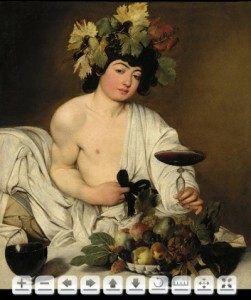 Olson guided a reporter through some of the overlooked details of the 1590s painting of the pagan deity, including the seductive mimicry of dark hair intertwining with grapevines as well as the “aha!” moment of the figure in the wine carafe. Going down deep into the craquelure, or fine web of cracks caused by age, reasserts the “made-ness” of the object, Olson says. The Uffizi Gallery in Florence, one of Italy’s most trod-upon tourist sites, is the latest museum to open its doors to HAL9000. Tech lead Mauro Gavinelli and a team of six shoot the priceless paintings when the museum is closed to the public. Natali remembers studying masterpieces from black-and-white photos, followed by color prints that were “dangerous, because the colors often weren’t true to the original and could lead to false conclusions,” he said. Nowadays, scholars around the globe can access online image services like Artstor. Such websites are helpful, but quality can vary widely. For most people, however, it’s easier to ogle masterpieces from a computer screen than in real life. Many of the paintings HAL9000 will digitize — all without bulletproof glass protection and in some cases without distracting frames — are not available for museum loan, and others can be difficult to view because they are more mobile: Bacchus, for example, has been on hiatus from the Caravaggio room in the Uffizi since May, starring in another exhibit. HAL9000, based in the Northern Italian town of Novara, has plans to digitize another 24 Uffizi masterpieces, including Michelangelo’s Tondo Doni. This entry was posted in daily life and tagged Botticelli, Caravaggio, Florence, HAL9000, Halta Definizione, Last Supper, Michelangelo, tech, Todd P. Olson, Tondo Doni, uffizi, Vincenzo Mirarchi by . Bookmark the permalink.